The information that has become available since our meeting in early September confirms a continued moderate but steady recovery of the euro area economy and a gradual rise in inflation, in line with our previous expectations. The euro area economy has continued to show resilience to the adverse effects of global economic and political uncertainty, aided by our comprehensive monetary policy measures, which ensure very favourable financing conditions for firms and households. Overall, however, the baseline scenario remains subject to downside risks. Looking ahead, we remain committed to preserving the very substantial degree of monetary accommodation which is necessary to secure a sustained convergence of inflation towards levels below, but close to, 2% over the medium term. To that end, we will continue to act, if warranted, by using all the instruments available within our mandate. In December the Governing Council’s assessment will benefit from the new staff macroeconomic projections extending through to 2019 and from the work of the Eurosystem committees on the options to ensure the smooth implementation of our purchase programme until March 2017, or beyond, if necessary. Let me now explain our assessment in greater detail, starting with the economic analysis. Real GDP in the euro area increased by 0.3%, quarter on quarter, in the second quarter of 2016, after 0.5% in the first quarter. The latest data and survey results point to continued growth in the third quarter of 2016, at around the same pace as in the second quarter. Looking further ahead, we expect the economic expansion to proceed at a moderate but steady pace. Domestic demand should be supported by the pass-through of our monetary policy measures to the real economy. Favourable financing conditions and improvements in corporate profitability continue to promote a recovery in investment. Moreover, still relatively low oil prices and sustained employment gains, which are also benefiting from past structural reforms, provide additional support for households’ real disposable income and private consumption. In addition, the fiscal stance in the euro area will be broadly neutral in 2017. However, the economic recovery in the euro area is expected to be dampened by still subdued foreign demand, the necessary balance sheet adjustments in a number of sectors and a sluggish pace of implementation of structural reforms. The risks to the euro area growth outlook remain tilted to the downside and relate mainly to the external environment. According to Eurostat, euro area annual HICP inflation in September 2016 was 0.4%, up from 0.2% in August. This reflected mainly a continued increase in annual energy inflation, while there are no signs yet of a convincing upward trend in underlying inflation. Looking ahead, on the basis of current oil futures prices, inflation rates are likely to pick up over the next couple of months, in large part owing to base effects in the annual rate of change of energy prices. Supported by our monetary policy measures and the expected economic recovery, inflation rates should increase further in 2017 and 2018. Turning to the monetary analysis, broad money (M3) continued to increase at a robust pace in August 2016, with its annual rate of growth standing at 5.1%, after 4.9% in July. As in previous months, annual growth in M3 was mainly supported by its most liquid components, with the narrow monetary aggregate M1 expanding at an annual rate of 8.9% in August, after 8.4% in July. Loan dynamics followed the path of gradual recovery observed since the beginning of 2014. The annual rate of change of loans to non-financial corporations stood at 1.9% in August 2016. The annual growth rate of loans to households also remained stable, at 1.8%, in August. Although developments in bank credit continue to reflect the lagged relationship with the business cycle, credit risk and the ongoing adjustment of financial and non-financial sector balance sheets, the monetary policy measures in place since June 2014 are significantly supporting borrowing conditions for firms and households and thereby credit flows across the euro area. The euro area bank lending survey for the third quarter of 2016 indicates some further improvements in both supply and demand conditions for loans to the non-financial private sector. Furthermore, banks continued to report that the ECB’s asset purchase programme and the negative deposit facility rate had contributed to more favourable terms and conditions on loans. Monetary policy is focused on maintaining price stability over the medium term and its accommodative stance supports economic activity. As emphasised repeatedly by the Governing Council, and as again strongly echoed in both European and international policy discussions, in order to reap the full benefits from our monetary policy measures, other policy areas must contribute much more decisively, both at the national and at the European level. The enhancement of current investment initiatives, including the extension of the Juncker plan, progress on the capital markets union and reforms that will improve the resolution of non-performing loans will also contribute positively to this objective. In an environment of accommodative monetary policy, the swift and effective implementation of structural reforms will not only lead to higher sustainable economic growth in the euro area but will also make the euro area more resilient to global shocks. Fiscal policies should also support the economic recovery, while remaining in compliance with the fiscal rules of the European Union. Full and consistent implementation of the Stability and Growth Pact over time and across countries remains crucial to ensure confidence in the fiscal framework. At the same time, all countries should strive for a more growth-friendly composition of fiscal policies. Question: Could you give us a bit of a clearer idea on how you will assess whether inflation is on a sustained path towards price stability? Some of your colleagues have said that perhaps you might want to see a period of overshooting; or will you be looking at core inflation? 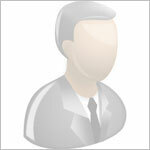 What are going to be the key parameters that you'll be looking at? My second question is: has there been any discussion today about a change in policy, specifically whether you might want to extend the QE programme beyond March 2017? 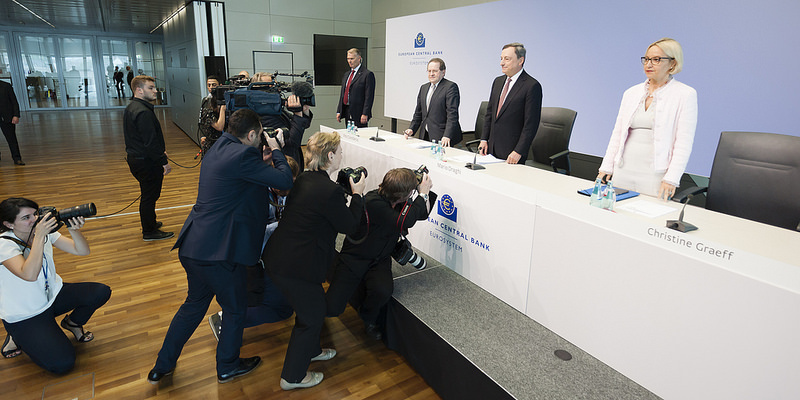 Draghi: The answer to the second question is no, there was no discussion. In answer to the first question, it's really nothing new. I myself and my colleagues, I think, said several times that when we speak of convergence to our objective, this convergence has to be sustainable and durable, and actually as a matter of fact should be self-sustained. In other words, right now we're all aware that the monetary policy support that is in place is extraordinary. And we know and I've said that the projections that are part of our outlook reflect financing conditions, which reflect expectations, that this support remains in place. The financing conditions not only, of course, are the output of these expectations, but also of other factors – like monetary policies in other jurisdictions, but more generally of many other factors. So they do reflect also the expectation that this extraordinary policy support will remain in place. But does it mean that it can stay in place forever? The answer is of course no. We want a convergence which is self-sustained, in other words, without the extraordinary policy support that is in place now. Second, we've said several times that durable convergence means that this objective should be achieved in a sustainable and durable way. Namely, we'll look through blips that are caused by other factors. I think I've said everything here. Question: My first question is, you said in December you’ll benefit from the work of the committees reviewing the programme. So, could you give us a bit of a flavour of, I guess, certain reports, preliminary reports on the work of committees that have already arrived? Just give us a general idea, a broad outline of what measures you could be looking at, what measures are definitely out of the question. My second question would be more general, I guess: in your opinion what really provides the stimulus in your QE programme? Is it the stock or the flow of your purchases? Because when you first designed the programme you gave the market a clear idea of the size. Now more recently the focus of the market seems to be shifting more to the monthly flow of your purchases. How would that shift impact your current review of the programme, and your eventual decision to exit the stimulus? Draghi: Let me tell you that the second point was not discussed, but it's in a sense part of your first question. We took stock of the ongoing technical work in the committees – work that is designed to ensure a smooth execution of the programme until March and beyond if necessary. We had a seminar and work was presented. We discussed various options, but options that really we consider in case we should be confronted with a shortage of purchasable bonds in some jurisdictions. The Governing Council reaffirmed the importance of very supportive financing conditions in fostering the recovery and a gradual return of inflation to levels close to 2% over the medium term. Sometimes it's also important to say what we did not discuss, and we didn't discuss tapering or the intended horizon – and here comes the second question – of our asset purchase programme. And by the way, the Governing Council reaffirmed that it certainly would take into account the input of the committees, but it just remains the ultimate decision-maker here. Question: You just mentioned there that tapering wasn't discussed today, but do you expect it to be on the agenda six weeks from now? And just to return to the point about stock and flow: you mentioned in answer to the first question that your forecasts reflect expectations that the support that you've provided remains in place, but there's a stock and flow issue here as well, I think. Do those forecasts reflect the idea that the stock of purchases will remain the same, or that the flow will remain the same at €80 billion a month? Draghi: I'm sorry to say, but we haven't discussed that. We haven't really touched on the issue at all. We simply listened to the outcome of the committees' work and we mandated the committees to continue working. And as I said, the Governing Council will take as one of the inputs the committees' work but it remains the ultimate decision-maker. About the expectation, what's going to be in the agenda for the December meeting, we haven't really yet discussed that at all. But more generally, it's quite clear that our decisions in December will tell you what we are going to do in the coming months, and so they will define the monetary policy environment for the coming weeks and the coming months. Question: I know you say you didn't discuss the measures that might be taken to prolong QE. I wonder if you could give a sense of whether certain of them might be less contentious or more effective when that discussion does take place, in terms of buying beneath the deposit-rate floor, or the other options? My second question is on tapering: is there a possibility that there couldn't be tapering? That there would just be an abrupt end to the bond purchases? Draghi: That was never discussed, as a matter of fact. I would say, an abrupt ending to bond purchases? I think it's unlikely. On the first question, in a sense, why are we waiting for December? Because we want to see all the inputs that are useful to have this discussion, and that's important for having one view about which the Governing Council members can express their opinion. Right now we have options. In other words, to be more precise, we didn't go at all in the exercise of counting views or majorities – or not. Question: My question is about negative rates, because some central bankers have expressed concerns in the last days on the effects of negative rates on the lending of some banks. So I wondered if you've talked about it today in the Governing Council, or if there are some outcomes already on the effects of negative rates? Draghi: First, we briefly touched on negative rates, or low rates more generally, during the discussion we had about the current outlook. The conclusion was that they don't hinder the transmission of our monetary policy. We have no evidence they actually hinder the transmission of our monetary policy. In other words, low rates work. They have worked, like they've worked in other policy jurisdictions, and we are not the first to have low rates. Let me give you again a few numbers, some of which you've heard before. First of all, what would happen if rates had not been what they've been? The counterfactual. The numbers here are that our measures taken from 2014 to March 2016 have generated additional inflation, cumulative inflation over the 2016-2018 period of 1.4 percentage points, and 1.3 pp of additional growth. The second point is, just look at the behaviour of rates since then till now. They are dramatically lower across the spectrum. We've basically eliminated what was called redenomination spread. We've eliminated fragmentation. If I just spend a second on the recent BLS, the recent bank lending survey, we see that net loan demand continued to increase for all loan categories. The credit standards continued to ease for households, and after nine months of continued easing they were unchanged for non-financial corporations, companies. And terms and conditions continued to ease, although banks expect a small tightening. Corporate bond issuance increased markedly. That's the other, I would say, significant number. The net issuance of corporate bonds in September has been very marked, and it's basically caused by our corporate bond purchase programme. Lending rates are now at a historical low – that is another point that we want to remember – and the credit volumes have recovered since the beginning of 2014 from, by and large, -3% growth in 2014 to +2% growth now. But as you can see the growth is still subdued. So it continues. It's steady. It follows basically the real economy growth. It's steady but it's moderate. But there are other important pieces of evidence that come when we look at M3, where we see that the largest contribution to the robust growth of M3 comes more and more from non-governmental sectors, namely households and firms. So these are all pieces of evidence that our policy is being transmitted more and more effectively to the economy. Question: Also in the bank lending survey, it emerged that demand in Italy and Spain was falling in their third quarter. How do you explain that the impact of your policy ­– a lot of it is directed at getting credit flowing again – is being felt unevenly in this respect across the eurozone, and is there anything you can do to address that? A second question on the topic of bail-in, which is a new rule to spread losses of banks in trouble: to what degree are the markets ready for a bail-in in the event of a large financial institution? Draghi: Let me respond first to the second question. Bail-in rules are in place and they have enough flexibility that would allow to cope with a variety of possibilities. So there isn't any reason to be specially concerned. The Commission has all the power to apply the rules and to interpret the rules according to existing legislation. Having said that, I don't see at the present time any such outcome or any such possibility. The other question: first of all I wouldn't make too much of that data point. It's only the first data we see after a long sequence of positive data. Second, loan demand depends on many factors other than monetary policy, and we'll have to see what is the current economic situation concerning these two countries. We look at the aggregate. In the aggregate of the eurozone the developments are what I outlined before. Question: I have a question regarding the scarcity of safe assets, which is for example distorting the repo market in Europe. How concerned are you about the fact that this is happening, and are there any contingency plans in case there is further stress in that market? Second question is a bit larger. There are some people who are arguing, at least here in Europe, that what we are seeing currently is sort of an economic war between Europe, Germany and the United States, looking at all the large fines – talking about Apple, for example, or also the Deutsche Bank potential DoJ fine. What do you think? Are we here in a political game, or what do you see? Draghi: The answer to the second question is no, we are not. At least, that's my perception. We are not in a political game. All parties in doing what they do apply legislation, apply laws, apply rules. They are not acting because they are politically motivated. Again, that's my individual perception. People may have different views about that, but the impression is not at all of a political war here. On the other point, we discussed scarcity, as I said: we had a seminar, they presented. Much of the discussion was about how to overcome scarcity if that were to become a problem. It's not a problem now. The asset purchase programme continues to run smoothly. The corporate bond purchase programme has been a success, so far, beyond, in fact, our expectations. So it's not a current issue, but just in case, much of the discussion was around that theme. Question: The bond markets have reacted quite strongly to the report that the ECB could gradually wind down its bond purchases. Were you surprised by the market reaction, or was it in line with your expectation? My second question is, you've stressed that there are still important risks in the forthcoming months. Could the ECB, for example, still lower its interest rates if external risks materialise? Draghi: In answer to the second question: we haven't discussed anything like that. As I said, we simply took stock of the committees' work, and we discussed the current outlook, which hasn't changed much since the last time we met. On the first question, I've seen the market reaction, and that's why I said that the Governing Council is the ultimate decision-maker that will use the input from the committees as one of the inputs in the discussion. So that's why I said that. Was that expected or not? It's very difficult to answer about my expectation of a market reaction following kind of a random statement made by somebody who didn't have any clue or information about that. Question: I have a question about your asset purchase programme. If there were a downgrade of Portugal tomorrow by DBRS, would that provoke an immediate stop to your purchase of Portuguese bonds? And could you report any news or any progress on Greece in the respect of purchasing their bonds. My other question is about a recent statement by British Prime Minister May who said there were bad side effects from QE and ultra-low, very low interest rates. One of them she pointed out was growing inequality. I wondered what your opinion was on that. She also said that “a change has got to come and we are going to deliver it”, which was read as an attack on central bank independence. As many statements are made also in this country and other countries of the euro area for you to change your monetary policy from policy makers and politicians, I wonder if you feel there is a growing feeling among politicians, or a growing threat from politicians to central bank independence. Draghi: No, I don't feel threatened. Neither is the independence of monetary policy by the Governing Council threatened. On the inequality, we certainly have looked at that, and I think we've discussed that on other occasions. The point is – and there is actually an interesting study by the Bundesbank on whether more generally non-conventional monetary policy measures increase inequality: the answer is, by and large, no. And the reason is that the main source of inequality is unemployment. So to the extent that monetary policy is effective, it will reduce inequality. Although as you buy assets from people who are wealthy in the short run, you certainly increase inequality. But when you look at things over the long run, no, the answer is no. That's what I would say about that. You asked me about Portugal and Greece. On Portugal, the bonds are currently eligible as the first best rating is BBB- with a stable outlook by this rating agency. And we know that if there is a downgrade, marketable debt instruments issued or guaranteed by the Republic of Portugal would become ineligible as collateral for monetary policy operations, and for purchases under the PSPP. Having said that, we should acknowledge the remarkable progress that's been achieved in Portugal. Of course, there are vulnerabilities that the government knows very well, and the government is aware that ambitious reforms are needed. From our angle, there is one area that I want to highlight, which is the corporate debt restructuring and addressing the problem of the NPL, the non-performing loans. So that's what it is. About Greece: discussions about debt sustainability are continuing. We have expressed, like others, like everybody else, concerns about debt sustainability, therefore measures have to be undertaken to address this problem. And the Governing Council, when time will come, will assess in an independent way the debt sustainability. Until then it's premature to speculate about purchasing bonds. Question: We'll come back to the question raised before. My colleague asked you if you were surprised by the market reaction after this Bloomberg report. I will ask you how the ECB profited from this market reaction. I mention, for instance, the tightening of some rates on the long curve that maybe help for a smooth implementation of QE. So how did the ECB profit from these weeks before? The second question: we have seen that the hard landing of an aircraft on Planet Mars can cause damage; that's certainly not making a parallel with what the ECB wants to go through with a sudden stop of QE. But you made this statement before, simply ruling out a sudden stop of QE – also you haven't discussed it any time yet, now, in the Governing Council. But what makes you so sure, in this statement you made? Because there is another – the Bank of England, for example, experimented with the sudden stop of a purchase programme. So are you choosing the Fed way, for example? Draghi: The answer to the second question is that my perception is that the sudden stop, as it was outlined before, is not in anybody's mind. It's not present in anybody's mind. It's not something that people naturally contemplate. And there are many reasons, and fairly obvious reasons, why this is so. On your first question: actually I never thought that we could profit out of sudden moves coming from unauthorised and probably uninformed sources. I have no idea whether the ECB profited out of that. But certainly I can only reiterate that profit is not the reason why we run monetary policy. Question: My first one is, you said that the extraordinary monetary policy support cannot stay in place forever. Do you have a feeling that market participants and investors are a little bit too complacent about QE being there forever, or at least for a very, very long period of time? And do you think it would make sense if they prepare themselves for the end of QE? The other one is on inflation expectations. I guess you had the survey today. What does it say regarding the longer-term inflation expectations, and related to that, what is your assessment of the most recent developments of the inflation expectations on financial markets? Because they have not really picked up, although inflation is rising. 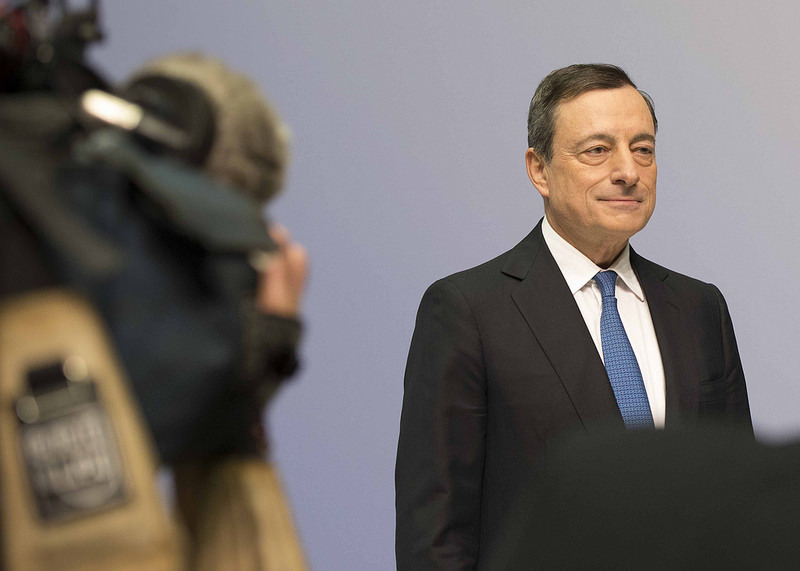 Draghi: As far as market expectations go, I can only, in a sense, respond by pointing to the fact that the current outlook and our baseline scenario of a rate of inflation which would gradually converge towards our objective, is predicated on the current financing conditions, which are accommodative because they are themselves based on the remaining in place, amongst other things, of the extraordinary monetary policy support offered by the ECB monetary policy, and that's it. That's what markets expect. Do I have a sense that they are complacent, or not? I think this is part of the more general category of financial stability risks. We certainly continue to monitor financial markets, and so far we haven't seen evidence of bubbles. I define a bubble as a marked rise in asset prices accompanied by a marked increase in leverage. So we monitor financial stability risks; we have not seen any systemic bubble of any kind. We have expressed several times the point that these bubbles ought to be coped with macroprudential instruments. I think that's it, on this point. On inflation expectations, we have two sets of inflation expectations: the survey-based inflation expectations and the market-based. The survey-based have been by and large more stable than market-based ones, and in the long term point to 1.8%, if I'm not mistaken. And they've been quite stable all throughout this period. The market-based inflation expectations have been more volatile as they are based on financial instruments, and therefore the market developments for these instruments do affect, in a sense, also the expectations. We've seen that in the period immediately before and more markedly after the British referendum, inflation expectations by and large across all horizons have declined quite significantly. But then now, more recently, they are recovering their path. So we're also looking at that. It's part of our information set. Though we have to be aware that certain stable pieces of evidence, like for example the correlation between inflation expectations and actual inflation, or inflation expectations and the oil price, have been themselves very volatile. So it's very difficult to really draw any stable inference from these correlations at the present time. Question: Would you rule out raising interest rates while QE is still in place? Question: Since the beginning of June, the ECB has bought more than 660 corporate bonds. According to Bloomberg, among these companies are Nestlé, Glencore, Novartis, Roche: all in all nine companies from Switzerland that have nothing to do with the euro. So why, Mr President? That's my first question. The second question is, five-year corporate bonds with a BBB rating now yield 0.23%. This is just one notch above junk bond level, and I think that's money for peanuts. So your bond-buying programme only reduces the refinancing costs for large caps, therefore it helps these larger companies to take over smaller ones. Your corporate bond-buying leads to a distortion of competition: you support the big corporations and you jeopardise the smaller and medium ones. My question is, how can you justify this? Draghi: Well, I don't have to justify it; I just say that it's not true. As a matter of fact, both the corporate bond programme and the covered bond programme do benefit SMEs as well. They have increased the issuance by large corporates, of course, but in so doing they free space in bank lending. So you can see actually that the spread between loans to SMEs and loans to large corporates has declined quite considerably.